Endowed with positive attitude that rarely deserts him, Gomez is intelligent, energetic and helpful. 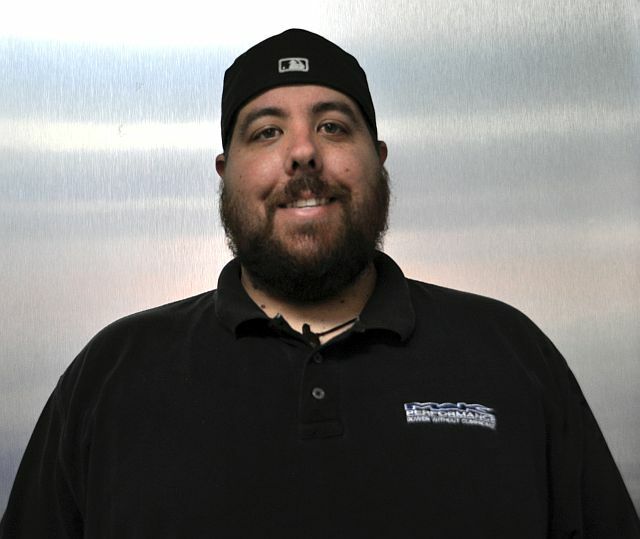 Adrian Gomez, an industrious 27-year old who manages Mak Performance, a Miami specialty shop established in 1995, bought a 2015 Mustang 5.0 and with fewer than 7,000 miles on the clock installed a Pro Charger centrifugal supercharger. It extended the Mustang’s power output at the rear wheels from 376hp to 600hp, an impressive 60 percent improvement. 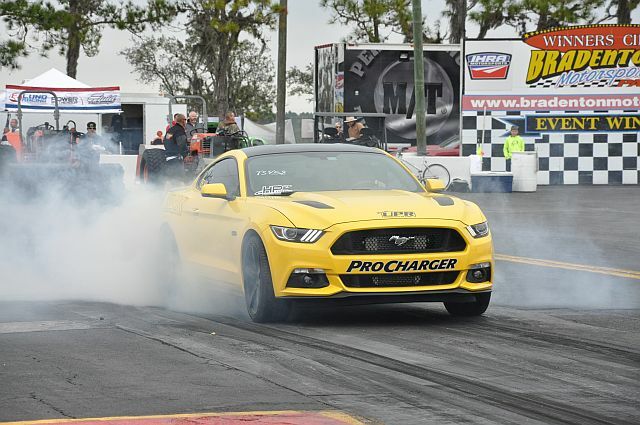 With one of the two vital ingredients in place—225 additional horsepower—he decided that instead of fulfilling the role as a drag race spectator at the NMRA season opener at Bradenton, he would present himself as an entrant in the True Street class. This leads us to the second vital ingredient—the clutch. Doubtless it was tempting to ascertain just how long the original factory clutch might support the additional horsepower…and it didn’t take long to find out. 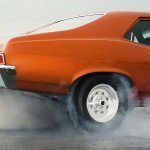 The car slipped the clutch on the first pass, running an Elapsed Time of 11.97 seconds over the quarter-mile distance and by the third pass it had overheated and was on the road to ruin. Undaunted the intrepid young Gomez limped back to Miami where he would replace the failed clutch system with a twin-disc clutch-flywheel set-up. His objectives were to acquire better friction materials, 2,400psi of clamping force and an easy clutch pedal feel for stop-start traffic conditions. 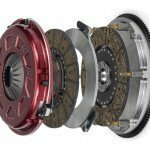 For all of that, there is no intrinsic weakness in the original equipment Mustang’s clutch arrangement. 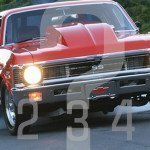 It is just that it was neither designed to transmit 60 percent additional horsepower nor to transmit it via twenty-nine-inch diameter Mickey Thompson Drag Radials. Nonetheless, its street-driving capacity contrasts starkly with Ram’s Force 10.5 dual-disc clutch-flywheel arrangement, which was designed to accommodate street and track use. Which style do you favor Sir—stand style of strap arrangement? 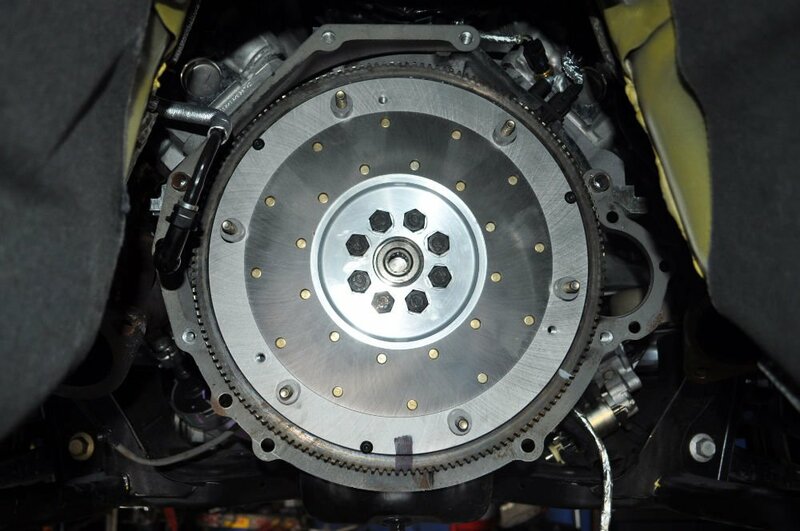 Of the diaphragm clutch style, the Force 10.5 is constructed with either stands or straps to secure the floater plate to the flywheel in relation to the sprung top clutch disc and the solid bottom disc. The hub of the top disc incorporates eight urethane-encapsulated compression springs to absorb engagement and disengagement forces. A Marcel spring, a thin wavy device sandwiched in the middle of the disc, also helps cushion these forces and reduces the potential for chatter. The issue with the stand arrangement, however, is noise though it is the stronger of the two designs. The floater has a millimeter or two to move about on its six stands as the car is at idle with the clutch pedal depressed or when it is released to move the vehicle. Though not a concern with a racing application, it can become an irritant when street-driving takes prominence over track use and for this reason Gomez selected the strap-driven style. 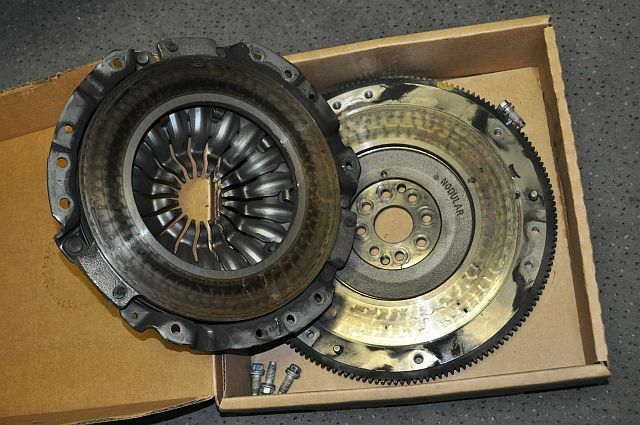 Curiously, he opted for two 900-series clutch discs, which are situated each side of floater plate. 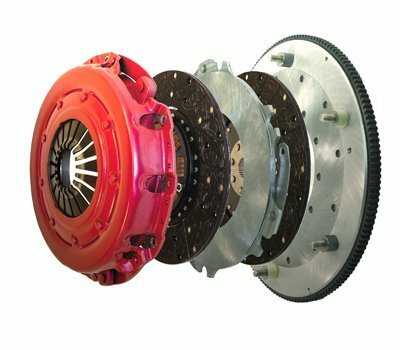 Clutch disc materials are divided into two types: 300 series and 900 series. 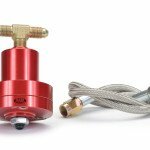 The 300 series refers to an organic material suited for high-performance street use while the 900-series represents a sintered-iron friction material more suited to the drag strip. 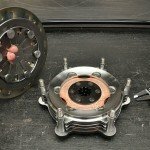 Though the additional power had a devastating effect on the original-equipment clutch, the replacement project took just over four hours and is explained here by the guiding hand of Adrian Gomez. Disconnect the shifter, O2 sensors, all wiring connections, starter motor and exhaust system. 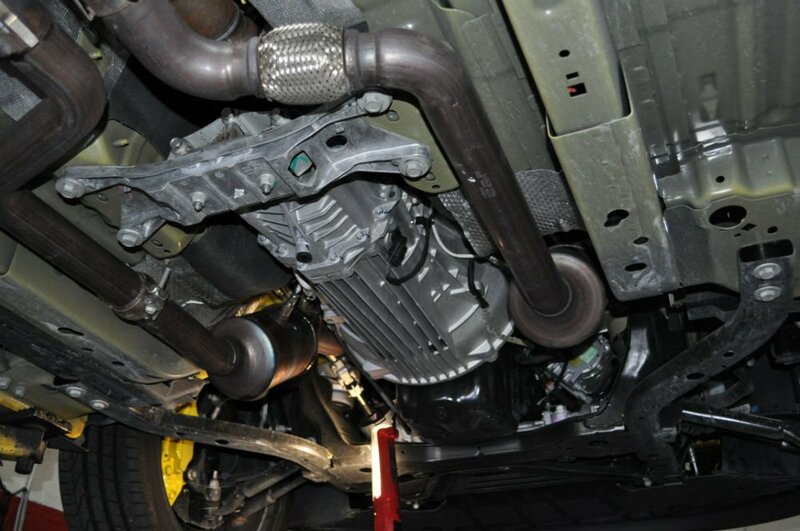 Remove driveshaft, after marking the flange to maintain alignment, and transmission. Undo the bell housing and clutch cover assembly. 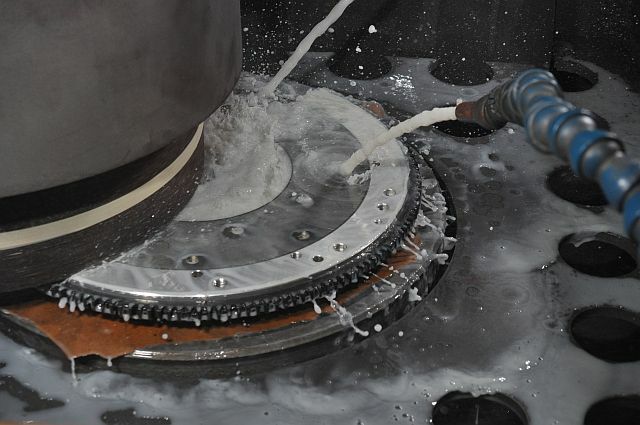 This SFI certified billet aluminum flywheel is light and thus accelerates and decelerates faster. The steel insert that interfaces with the clutch disc is 1/4in thick. Hence it dissipates clutch heat without distortion. Premium flywheels possess four essential elements: a proper friction surface finish, a perfectly flat friction surface, a friction surface parallel to the crankshaft flange and a fine balance to within half-oz/inch. 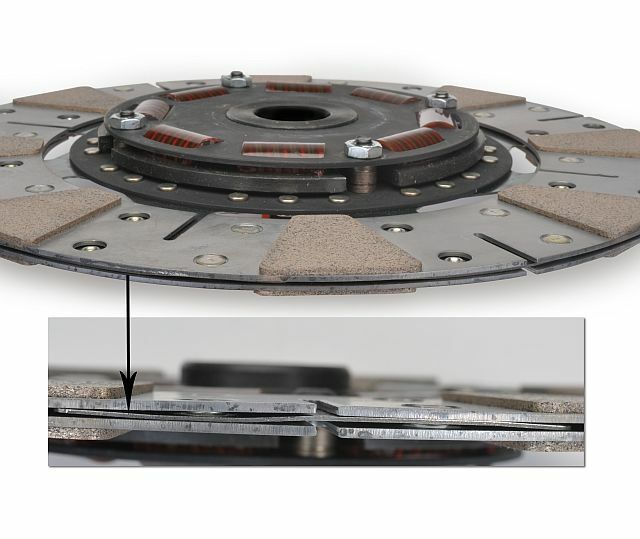 A Marcel spring is a thin wavy device sandwiched in the middle of the clutch disc. It is introduced to cushion aggressive driveline forces and to reduce potential for chatter. No modifications necessary. Ram constructs their upgraded clutch systems with the identical installed height specifications as the original factory system. 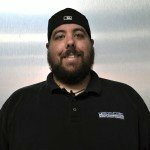 Here is the sequence of upgraded clutch components in Ram’s Force 10.5 system. Offering clamping force of 2,400lb and a choice of organic 300-series discs or sintered-iron 900-series, Gomez chose the latter—which transmits up to 1,400hp. Both sides of the floater plate are ground to same tolerance as the flywheel. Replace all components removed earlier in the reverse order. Excellent write up, very informative. What part numbers did you use? Where did you buy the clutch setup? Thanks Again! The parts were purchased through MAK Performance, as we are a RAM Clutches Distributor.